Nigeria’s Vice-President, Yemi Osinbajo says government alone cannot provide the kind of support required for universities to develop at the rate expected of them. He said a lot of the support had to come from alumni of the universities as well as the private sector. According to a copy of his speech made available to the Media on Saturday by his Senior Special Assistant on Media and Publicity, Mr. Laolu Akande, the Vice-President spoke at the Distinguished Alumni Awards and celebration of University of Lagos at 55 held in Lagos on Friday. He said great universities all over the world are run by alumni and the private sector. “Just as the pro-chancellor pointed out, government alone cannot support universities to the extent that is required, to keep them even at the current levels. “A lot will have to come from the Alumni and the private sector. That’s how great universities all over the world are run. “I am so excited to see that our fundraising project is one that has clearly shown the way to go with respect to developing our University,” the Vice-President. 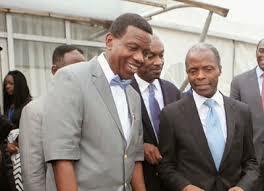 Osinbajo, himself an alumnus of UNILAG, said the university had proved many times that it is not only a university of first choice but also the University of firsts. He cited examples of the General Overseer of the Redeemed Christian Church of God, Pastor Enoch Adeboye; and his counterpart in the Mountain of Fire and Miracle Ministry, Dr. Daniel Olukoya, who he said recorded firsts in their careers. He noted that while Olukoya was the first to clone genes, Adeboye is the first Nigerian to get a PhD in a Nigerian university in Applied Mathematics. He said, “I want to say that UNILAG has proved time and time again to be not just a university of first-choice but also the University of firsts! So many firsts in different areas; just reading about Dr. Olukoya, he was the first to clone genes. “Hardly anyone would know that the pastor and founder of Mountain of Fire and Miracles was also the first to clone genes. That is an absolutely outstanding thing. “The General Overseer of the Redeemed Christian Church of God was also the first Nigerian to get a PhD in a Nigerian university in Applied Mathematics.